Xiong is a highly motivated person with a passion for information technologies, programming, and solution, specialized and working in smart cards industry, with business development skills. He is currently working as Technical Manager at Yosun. He successfully qualified 4 IT Certification namely Zend PHP, CISSP, PMP, and RHCE. He passed his Zend PHP certification and credits uCertify for his success. Zend offers an online training course, I felt it quite expensive, I’d like to recommend the alternative online course provided by uCertify, now I am halfway in the preparation and found it is a value of money, the course built up my PHP knowledge and confidence along the way. Before you start the course, you can have a Pre-Assessment to identify your readiness for the exam, weakest area, where do you need to improve. There are 20 chapters, now I am studying chapter 10, the structure of the content is well organized, it is an interactive e-book, with the video embedded, and by selecting the text, you can do the annotation, google search, etc. You can even test the PHP code by click the “try it yourself” button. At the end of each chapter book, there will be flashcard study to strengthen your important knowledge points, there will be a quiz and exercise to test your study results. the question in the test includes multiple choices, blank filling, drag and drop questions etc. 5. There is also the Test History & Performance Analytic, all the testing and exercise history was recorded, you can review it anytime, and you can retake the test, and furthermore, you can select to re-test the wrong questions only. This really helps you to practice and redress your weakest points. We are working on all the areas of improvement mentioned by him to provide a better user experience. You can read out the complete post here and know more about Mr. Xiong Hui Lin by visiting his LinkedIn profile. Posted in Study Tips, Zend. Want to learn the hottest programming language and excel career in the field of Web development? uCertify brings you a complete study guide that will help you master the skills of using PHP and MySQL. Learn the skills of Web development with PHP and MySQL course and performance-based labs. Performance-based labs simulate real-world, hardware, software & command line interface environments and can be mapped to any text-book, course & training. The course and labs provide knowledge and skills of the topics such as Web application security; MySQL administration; networks and protocol functions; image generation; debugging and logging; authentication and personalization with the real-world scenarios. The PHP and MySQL Web Development course and labs are designed for the web developers and professionals working in the field of software development with the PHP language in focus. This course teaches you all the basic and advanced concepts of PHP and MySQL such as uploading files to a server, handling exceptions, working with functions and form data and manipulating system files, and installing and configuring CakePHP on top of an existing PHP apache web server. 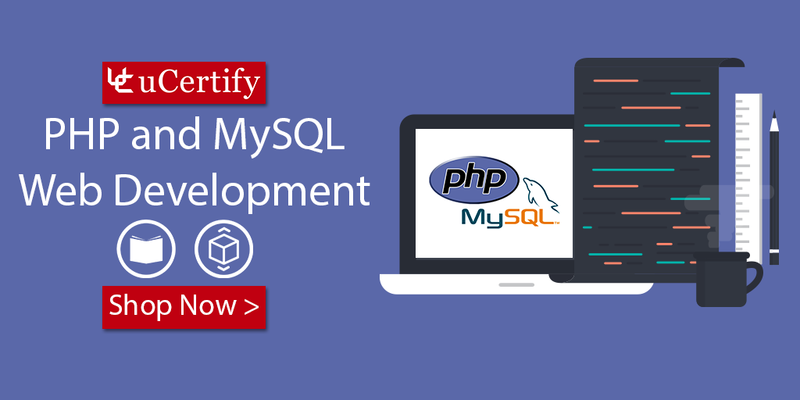 Enroll now in the uCertify study guide and become a proficient PHP/MySQL web developer. The study guide teaches you all the concepts of web development with its interactive learning resources. * Upgraded PHP 5.3 packages to version 5.3.8. * Upgraded Zend Framework packages to version 1.11.10. The structure of this new certification has not primarily changed compared to the prior version based on PHP 5.3. Most of the topics remain similar, while some have been updated. Zend PHP 5.3 certification exam is slated to retire by this year-end. Professionals willing to take this certification should register before 31st December, 2013 as after the specified retirement date the certification will no longer be valid. uCertify is going to release Test Prep for PHP5.5 exam very soon!